Signal processing is primarily aimed at extracting useful information, while rejecting the extraneous from noisy data. If signal levels are high, then basic techniques can be applied. However, low signal levels require using the underlying physics to correct the problem causing these low levels and extracting the desired information. Model-based signal processing incorporates the physical phenomena, measurements, and noise in the form of mathematical models to solve this problem. Not only does the approach enable signal processors to work directly in terms of the problem's physics, instrumentation, and uncertainties, but it provides far superior performance over the standard techniques. Model-based signal processing is both a modeler's as well as a signal processor's tool. Model-Based Signal Processing develops the model-based approach in a unified manner and follows it through the text in the algorithms, examples, applications, and case studies. The approach, coupled with the hierarchy of physics-based models that the author develops, including linear as well as nonlinear representations, makes it a unique contribution to the field of signal processing. The text includes parametric (e.g., autoregressive or all-pole), sinusoidal, wave-based, and state-space models as some of the model sets with its focus on how they may be used to solve signal processing problems. Special features are provided that assist readers in understanding the material and learning how to apply their new knowledge to solving real-life problems. The author demonstrates how the basic idea of model-based signal processing is a highly effective and natural way to solve both basic as well as complex processing problems. Designed as a graduate-level text, this book is also essential reading for practicing signal-processing professionals and scientists, who will find the variety of case studies to be invaluable. JAMES V. CANDY, PhD, is Chief Scientist for Engineering, founder, and former director of the Center for Advanced Signal & Image Sciences at the University of California, Lawrence Livermore National Laboratory. Dr. Candy is also an Adjunct Full Professor at the University of California, Santa Barbara; a Fellow of the IEEE; and a Fellow of the Acoustical Society of America. He has taught graduate courses in signal and image processing at San Francisco State University, the University of Santa Clara, and the University of California, Berkeley Extension. 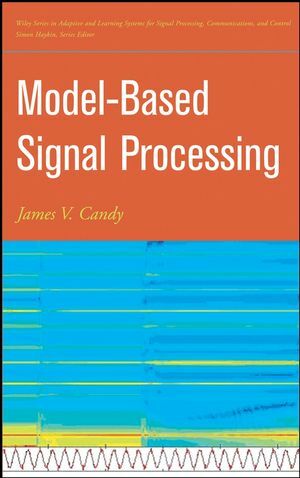 Dr. Candy has published over 200 journal articles, book chapters, and technical reports, as well as authored the texts Signal Processing: Model-Based Approach and Signal Processing: A Modern Approach. He was awarded the IEEE Distinguished Technical Achievement Award for his development of model-based signal processing. 2. Discrete Random Signals ans Systems. 4. AR, MA, ARMAX, Lattice, Exponential, Wave Model-Based Processors. 5. Linear State-Space Model-Based Processors. 6. Nonlinear State-Space Model-Based Processors. 7. Adaptive AR, MA, ARMAX, Exponential Model-Based Processors. 8. Adaptive State-Space Model-Based Processors. Appendix A: Probability and Statistics Overview. Appendix B: Sequential MBP and UD-Factorization. Appendix C: SSpack_PC: An Interactive Model-Based Processing Software Package.